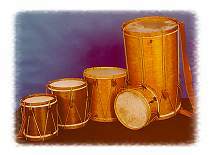 TABORS: Cylindrical wood drums, two skin heads tightened by rope tension, leather strap, adjustable gut snare. Five sizes. 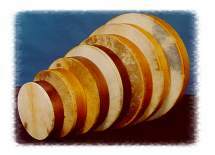 HAND DRUMS: Cylindrical wood shells with a skin stretched across one end. Diameters ranging from 10 to 22". TAMBOURINES: Two different designs - Middle Eastern (2 models) and Collegium. 18th CENTURY KETTLEDRUMS: Hand-hammered copper bowls with resonance funnel (Schalltrichter) built into the interior, calfskin heads. Basic Technique for Hand Drum and Tambourine: A step-by-step method for all experiences and backgrounds. One-hour tape; 16-page booklet. Price List and Order Form: All of our products listed with prices and ordering information. Copyright ©1998- Harms Historical Percussion.